North Bergen STEM Academy Congratulates the graduates of the Rutgers SMART (Science, Mathematics And Related Topics) Program. Click the title for more details. The students spent 10 Saturdays studying diseases that affect us here in the New York/ New Jersey area as well as in the United States. In addition, the students received hands-on experiences working in the laboratories of the Rutgers University Medical School in Newark. 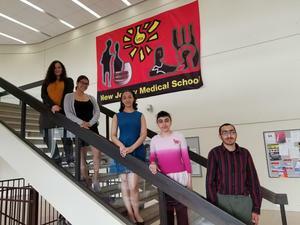 Finally, the students presented their work to an audience of over 300 guests and professors at the Rutgers Medical School Lecture Center.